As a dedicated fan since the release of their second album, Thickfreakness, it’s comforting witnessing a band evolve the way The Black Keys have. Their willing journey to experiment has yielded possibly their best achievement so far with Brothers. That journey, that has seen them move away from the stripped down basement fuzz production of a lone drum/guitar ensemble of the earlier records, to performing and producing a unique hip-hop record (Blakroc) to releasing the first thing that fully embraces every instrument and arrangement at their disposal. If producer Danger Mouse showed them the potential with a few keyboards on the excellent Attack and Release, Brothers proves that not only did the Akron duo learn from that, but utterly embraced it. One of the first things you notice about the album, besides the booming, glossy production values, is the fact that lead guitar is much less of a focus, and more of an element or component alongside the other instruments. This was apparent on Attack and Release to a degree, but not like here. There’s no spitfire angst like ‘I Got Mine’ for example (only second single, 'Next Girl' comes close). Brothers’ is decidedly percussion heavy. Driven by Pat Carney’s infectious beats, there’s still plenty of guitar skill being flung around of course, as Dan Auerbach is an evolving bluesman of the highest calibre, to omit it completely would be a foolish thing to expect. Here rhythm is his intent, though tracks such as 'She's Long Gone', 'Tighten Up' and a brief instrumental mid way through does bring the six stringer to the forefront a bit more just to reassure us. To truly hear how good Brothers is however, one needs to fully embrace and recognise the song writing, arrangements and vocals. In that sense it is the best possible, “expected” follow up to A&R, and fans of that album will probably love it. Lack of whisky inspired riffs and solos may have some wish for the pace and attitude of Rubber Factory or Thickfreakness, but you can’t hold a band back for playing what comes natural. 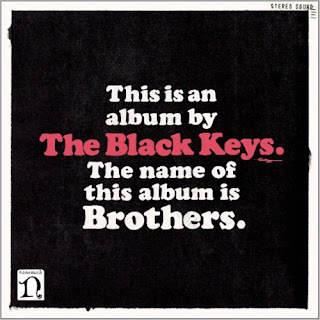 More than anything, Brothers sounds very much like the destiny of the Keys. A sort of Blues-fusion utterly unique to the boys. After six albums, listening to songs such as opener, ‘Everlasting Light’ groove its way into your body, it just feels right that they sound the way they do now. While not all fifteen tracks do hit the mark, it matters little as the whole album flows superbly. The vibe being constant, with the fact that no real songs stand out being a positive for the album as a listening whole. The first half is much punchier and dance floor orientated, but a gradual move to the slower numbers of the final third of the album is sublime and adds to the overall replay value. These are the tracks where TBK have always been at their best too. Towards the end, we get Dan in his finest form, ‘Never Gonna Give You up’ is worthy of being alongside the Motown classics that inspired it. ‘These Days’, a beautiful closer. As expected, his lyrics centre around lost loves and painful regrets. Fusing Soul, blues and hip-hop, TBK have achieved a sound befitting their obvious intentions. Auerbach reaching status as a vocalist on par with his idols. Though some may argue he already had, On Brothers, he finally achieves a voice of his own, striped almost completely of imitation or homage. Overall, an exceptional addition to their catalogue.